A team of UNCG faculty, staff and students is conducting program evaluation of NFL Foundation initiative Shift Why. From left to right: Samantha Kelly, Ashley Frazier, Danielle Vega, Dr. Muhsin Orsini, Dr. Jeff Milroy, Dr. David Wyrick, Lindsey Sanders and Pauravi B. Shippen-How. The infamous quote, attributed to iconic football coaches Vince Lombardi and Red Saunders, has been spoken in countless locker rooms across the country. But is winning really all that matters? According to the NFL, the answer is no. That’s exactly why the NFL Foundation is working with UNCG’s Institute to Promote Athlete Health and Wellness to change the win-at-all-cost culture in amateur athletics, focusing specifically on high school sports. The work is being led by Dr. David Wyrick, public health education professor and director of the institute, and Dr. Muhsin Michael Orsini, adjunct faculty member and director of evaluation for Prevention Strategies, LLC, a university spin-out company. 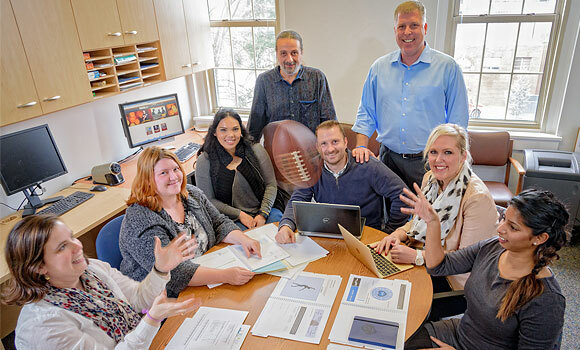 Wyrick and Orsini – along with their expert team at UNCG – have been tasked with leading the program evaluation work of the NFL Foundation initiative Shift Why. The goal of the initiative is simple: shift the culture of high school sports so that players and coaches are more focused on personal development and character building than wins and losses. The execution is more complex, which is why Shift Why is currently being implemented as a pilot program in Texas and Colorado. The UNCG team is using surveys, interviews, focus groups and document analysis, among other methods, to evaluate the implementation and initial impact of Shift Why and to determine the feasibility of replicating the initiative across all 32 NFL markets. While Shift Why may seem aspirational to some, Wyrick and Orsini have already seen evidence of the initiative’s success. “Coaches are intentionally providing character development opportunities for players, and we’re seeing a shared common language that values education-based athletics,” Orsini said. Erhmann and Redman meet with key state leaders, host training sessions and webinars, and provide tools and resources to get the initiative started. From there, the process becomes more organic. A key part of the program is changing the coach-player relationship, which historically has been transactional in nature: Coaches give players the opportunity to compete, and players help coaches win games. In addition to Shift Why, UNCG is providing evaluation for two smaller, yet similar, initiatives: Shift Why Urban, which will be implemented in Baltimore City this year, and InSideOut Coaching Character, a curriculum specifically for high school football coaches. And it’s not just professors and institute staff members who are getting their hands dirty. All three projects are supported by an undergraduate student intern and two graduate research assistants. “These students participate in planning meetings and are involved in every step of the process, from collecting the data to preparing reports that are presented to the NFL Foundation,” Wyrick said. For Wyrick, Orsini and their team, the project is an opportunity to make a difference.